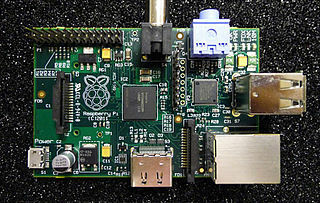 Raspberry Pi is an ARM based single-board computer, developed for educational purposes, costing USD 25. For more details, see the Wikipedia article about Raspberry Pi, or the FAQ list. Note: GHCi does not work on ARM with older versions, but it has become available in GHC 7.8. See this post on haskell-cafe for the status as of December 2013. Success with 7.8 on a Raspberry Pi 2. There seemed to be a point where GHCi was merged into version 7.4.2., and it may still be possible to install it in an experimental manner, but it is not (currently) available in the Debian Raspberry Pi repository. Here is a discussion thread wherein djhuk describes compiling and installing GHC-7.4.2 via QEMU to the Raspberry Pi, with incomplete GHCi functionality. To build a cross-compiler from Linux to Raspberry Pi (running Raspbian), see the GHC Trac.